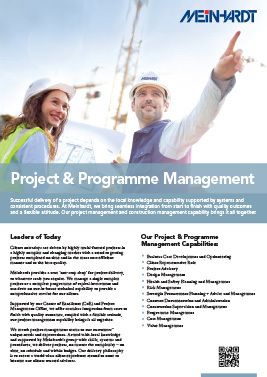 Meinhardt can manage a single project or a complete complex programme of project development. We can draw on our in-house technical capability to provide a comprehensive service for our clients, ensuring that the best Project Management Team are going to match the client's needs and expectations. We develop a project plan, which includes defining and confirming the project goals, mechanisms and objectives that help to enhance our project management and bring satisfaction to our clients. Meinhardt brings such a high level of expertise to decision making, many clients now rely on us to manage the entire process from project business case to project completion.